QUESTION: I have been a reader for 10+ year, Socrates subs and reg for Orlando WEC. Thank you and as a Veteran, I admire your courage and service. Ques: Under Dodd-Franks & Bail-In & Bankruptcy Priority; and, due to the Global Debt Crisis, is there a Custodial Risk for Investors a) who are “beneficial owners” (paid for the securities but holding securities in street name) but b) who are not the “Nominee Owner” (since normally the trade Clearing House or Custodian has the direct accounts at the Depository Trust Company). Is the risk due to the Global Debt Crisis affected by custody by the biggest banks, namely JPMorgan, Citibank, Goldman Sachs & Bank of America – in view of the FDIC record of these four biggest Wall Street Banks holding at 6/30/2018 $ 188.58 TRILLION of nominal derivatives of which $ 142.23 TRILLION are interest rate contracts? FDIC reports two, JPM and Citibank, have $ 36.8 TRILLION of custodial assets. Further, OCC.GOV reports 99.4% of the nominal derivative obligations of these four banks are held for trading, not for hedging. Worldwide, Deutsche Bank, for example, is notorious for their derivative obligations, while non-bank dealers like oil companies and others also write derivatives. In view of the M F Global seizure by JPM-Britain of USA sourced billions under City-of-London laws, is there a concern if the Custodial Companies have unsupervised authority to transfer title to securities to numerous other nations/laws? Finally, for Securities Lending, since the near-cash securities collateral is also in “nominee ownership” (custodian) at the Depository Trust Company and similar depositories around the world, in a Global Debt Crisis is there a risk to the (paid up) “beneficial owner” of the collateral? ANSWER: There is certainly a Custodial Risk going forward and many people are unaware of the broker/clearer risk. The derivative obligations are always thrown around in gross. The real risk is hard to quantify because you have to really net out all these positions. The Leham and Bears collapses were overnight because of posting these mortgage-backed securities ratings by S&P at AAA & others (see the Big Short) which enabled them to enter the REPO market. The derivative obligations are entirely different. This may not cause an overnight collapse but some sort of a work-out deal. The safer custodian would be Bank of New York if you are talking about just parking assets rather than trading. The risk of a crisis seems to be more 2020-2021. The Fed & Treasury would most likely step in when we are talking about the United States. There is a greater risk in Europe because they are all caught up in the problem of transfer payments between states. In other words, the bail-in problem in Europe is more about the refusal to bail out banks say in Italy with tax-payer fund from Germany. That issue does not exist in the USA so there is less of a risk in the USA than in Europe. If you are holding shares and you do leave them in the custody of a broker, they will keep them in “street name” so yes they can be taken as an asset of the firm as they did in M.F. Global. If the shares are to be held and you are not using them for collateral at a broker, it is best to take possession. Another trick is you can post them as collateral at a bank separate from a broker and borrow against them and use the cash for hedging. It is more complicated, but it would be best to do that sort of thing with a different entity. As far as an American institution sweeping accounts and sending the money to London pretending that they are the “owner” of the funds to post in the REPO market, that remains an open risk because the SEC and CFTC never prosecuted M.F. Global allowing that scheme to remain in place. These two agencies always look the other way when the big houses commit fraud. What we must understand is that the banking system model is inherently subject to booms and busts because it is fundamentally flawed and began as a fraud. Once upon a time, you paid a bank to hold your money for safekeeping. Then the banks figured they could lend your money out and make a profit keeping just 10% or less to cover withdrawals. Then when a crisis would hit, they could not get the cash back in time to meet the demand for withdrawals and the bank would close and the assets (loans they made) were then liquidated at deep discounts. The creation of the Federal Reserve was with the power to create money in times of crisis to meet the demand for withdrawals without having to dump assets in a panic. Then World War I came and instead of the Fed stimulating the economy by buying the corporate paper to directly create jobs, politicians instructed the Fed to buy ONLY government bonds. The Fed was never returned to what it was intended to do and today it can take over any corporation if it deems they are too big to fail no longer limited to banks. After PhiBro took over Solomon Brothers, Goldman Sachs took over J. Aaron. Suddenly, the trading of commodities mentality became the mainstay of bankers on Wall Street. Then Robert Rubin of Goldman Sachs/US Treasury Secretary pushed to overrule Glass–Steagall. That opened the door for these banks to then be officially trading with other people’s money. The end was now in sight. Today, the trading banks are typically also primary dealers and when they blow up because they are liable for deposits on a demand basis yet invest long-term, they then turn to the government for bailouts threatening them that if they do not cover their losses, the government cannot sell its debt. 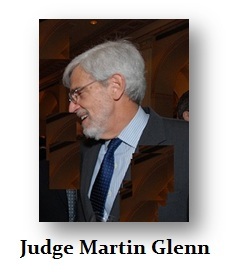 It was Martin Glenn who was the judge in New York on M.F. Global bankruptcy. He was the first one to engage in FORCED LOANS by abandoning the rule of law to help the bankers by protecting them from losses taking client accounts to cover M.F. Global’s losses. That is no different from what we saw in Cyprus. He simply allowed the confiscation of client funds when in fact the rule of law should have been that the bankers were responsible and M.F. Global’s losses should have been reversed. Never should the client’s funds be taken for M.F. Global’s losses to the NY Bankers. It was Judge Martin Glen who placed the entire financial; system at risk by trying to protect the bankers. He pampered these bankers making then the new UNTOUCHABLES. We have to be concerned that there really is no rule of law that will protect you in a crisis.